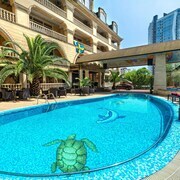 i stay in this hotel with my family every time i visit Sochi. 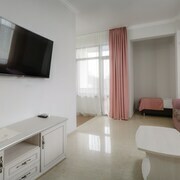 This is the most comfortable hotel for a family vocation. It got everything you need from an awesome dining to a private beach! Friendly personal!!! I recomend to everyone!!!! Staff was very courteous and informative. Close to the Black Sea. Where to find Dagomys hotels near an airport? 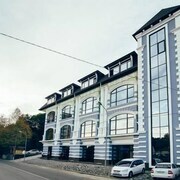 Where can I find hotels in Dagomys that are near tourist attractions? 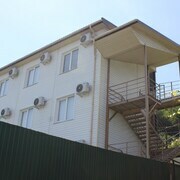 Accommodation options are in abundance in Dagomys. Spend some time exploring our 24 hotel options, which are all within a 0.1-kilometre (0.06-mile) radius of Dagomys' city center. 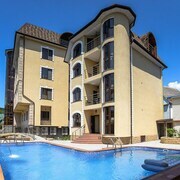 Our hotels that are within driving distance of Dagomys include the RODINA Grand Hotel And Spa and Sochi Rent a Home. The Mechta u Morya is located 35 kilometres (21 miles) from downtown Dagomys. Alternatively, the Grand Hotel Zhemchuzhina can be found 12 kilometres (7 miles) away. 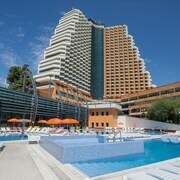 Other hotels and apartment options include the Marins Park Hotel Sochi and the Vesna Hotel. After you have spent time in Dagomys, why don't you travel a little further afield? The Southern Russia - Black Sea Coast region has plenty of things to offer. Southern Russia - Black Sea Coast is marked by rural landscapes, beaches, coastal plains and forests. Popular Southern Russia - Black Sea Coast tourist destinations include old towns and historic mansions. Common activities in this part of Russia include snowboarding and skiing. 35 kilometres (21 miles) to the southeast of Dagomys you'll find Adler, where you can explore Noviy Vek and Mandarin Mall. Should you wish to spend a few nights in Adler, be sure to check out the Radisson Blu Paradise Resort & Spa, Sochi and Radisson Blu Resort & Congress Centre, Sochi. 7 kilometres (5 miles) to the northwest of Dagomys, you can also stay at Loo, home to the MiLoo and Na L'vovskoy. Regardless of whether you're passing through or spending a few nights in Loo, make sure you visit the Aquapark Aqualoo and Loo Temple. Get your sports fix by taking a trip to Ice Cube Curling Center, which is 35 kilometres (23 miles) to the southeast of Dagomys. 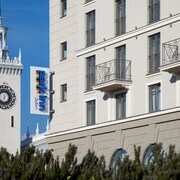 Sports fans wanting to sleep close to the action can take their choice from the Russian Seasons or the Shine House. 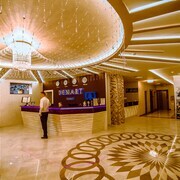 If you are traveling into or out of Sochi International Airport and are looking to stay nearby try Hotel Diana Palace or Hotel Meridian. 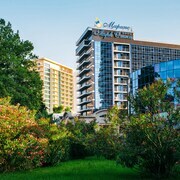 What are the most popular Dagomys hotels? Are there hotels in other cities near Dagomys? What other types of accommodations are available in Dagomys? Explore Dagomys with Expedia.ca’s Travel Guides to find the best flights, cars, holiday packages and more!